~ I am feeling rather stressed at how many things I don't have done yet for Christmas. But then I had a thought - I checked my archives from this time last year. *Ahem* - I did not have my Christmas cards started at this time last year either. Also? I did not have my tree decorated yet. 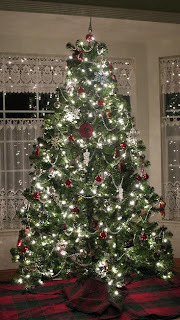 And I do not have my tree decorated now even though I showed you a pic of my decorated tree (last year's pic). ~ I'm going to be making several goodies today. I plan on making Dried Cranberry Biscotti, Christmas Mocha Balls, Vanilla Party Mix, and a batch of Vanilla Hot Chocolate Mix. 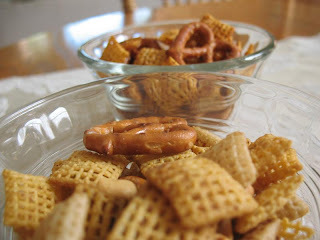 Oh and I do have to make Crunchy Party Mix too. There's probably something else I'm not remembering right now. What are you making? ~ I have been watching the show Sing-Off! Love it! Have you been watching it? I think the group Nota should win and that's all there is to it! ~ Tomorrow is Chocolate Friday, so don't forget to bring your delicious chocolates posts to link up! Thanks for putting up with my ramblings! Have a terrific Thursday friends! You better get busy my friend. Especially is you're going to get all that done and make it to my party tomorrow! LOL! Big your snoozing away cause I'm up early and on the east coast size hugs to you! Good gravy, girl! You are a busy bee. I ditched my list...the kid's comin' in town this afternoon and I am just saying "not gonna happen" to a couple of things on there (like clean the back porch and sew jingle bells on the stockings)...decided I'd better finish the girlfriends gift,...ya think??? Yup, talk about procrastination, I'll be putting in that last stitch as their plane touches ground, LOL. We should change the name of December to Crazember! Sorry about the tooth....maybe you should cut yourself a little slack, huh? I've been missing out on the Chocolate Friday. I'm busy baking today, too, so maybe I'll have something to add to tomorrow's postings! Prayers that it will be a filling ONLY (so you'll be all better Xmas morning). I'm sorry you're feeling overwhelmed...but if I know you, you'll pull it all off with style!